Stocks were under pressure again on Thursday, driving U.S. indices lower once again on the week. The Dow Jones is now flirting with its eight consecutive close lower. Is it time to shop around with some new top stock trades? Advanced Micro Devices (NASDAQ:AMD) has been on a mission, rallying off its $9 lows in April and piercing through $17 by mid-June. The run has been wildly impressive, but is it about to end? Shares are now changing hands in the upper-$15s, with some wondering if now’s the time to bail or double down. There are two levels that bulls can buy at, depending on how aggressive they want to be. 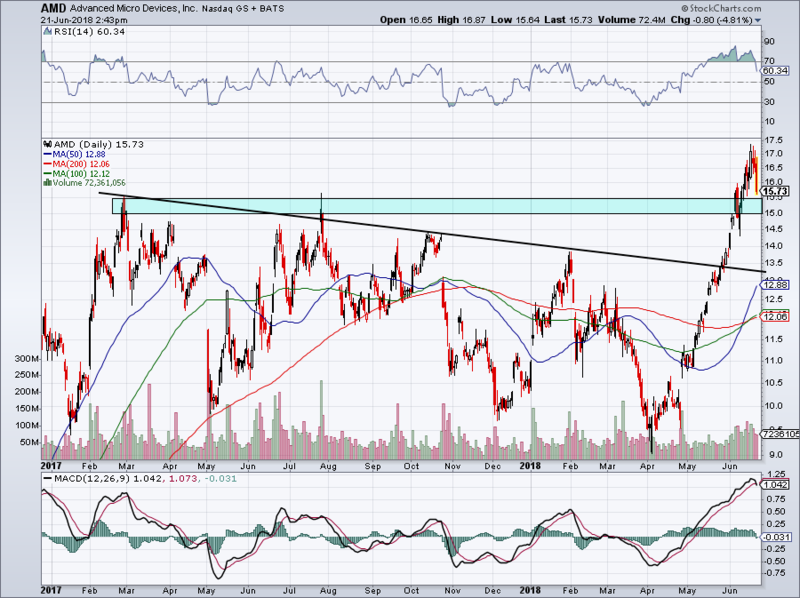 The first is between $15 and $15.50, the level that AMD burst through as it broke through long-term resistance. 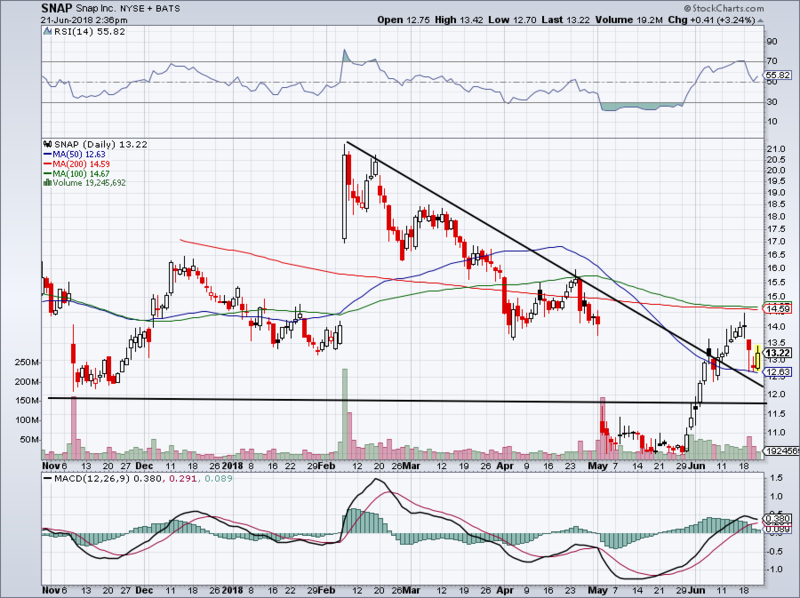 The second spot to buy is near $13.50, where AMD pushed through previous downtrend resistance. Just this week we asked if iQiyi (NASDAQ:IQ) had hit its ceiling. With its 10% pullback on Thursday, it’s at least hit a temporary one. For IQ, we’re looking to see how it handles this $35 to $36 area. 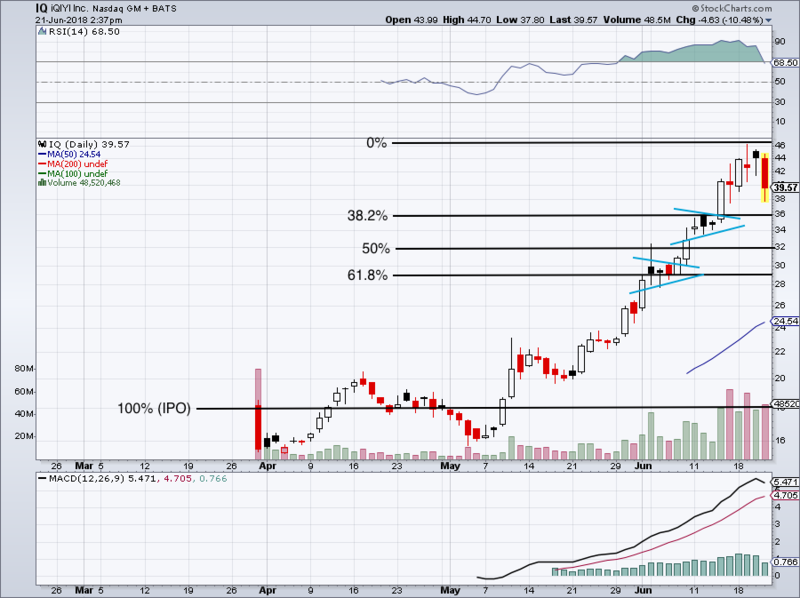 That’s where the stock last consolidated and its where the first significant retracement level (38.2%) sits. Should it hold and momentum stocks regain their feet, a rebound to $40 is in the cards. If it gives way, look to see how it handles the $32 level, or possibly the $28 to $30 area. Sure, call me Mr. Negative when it comes to Snap (NYSE:SNAP). I’m not bullish on Snap and with the progress that other companies are making, like Facebook (NASDAQ:FB) and its Instagram property, I don’t know I will change my mind anytime soon. At least I’ve been open though, saying that a move over $11.50 could kick-start a rally. For the bulls who are in this, make sure SNAP stock stays over this downtrend resistance level (black line). Should it fail and if $12 doesn’t hold up, a retest of the lows could be in play. 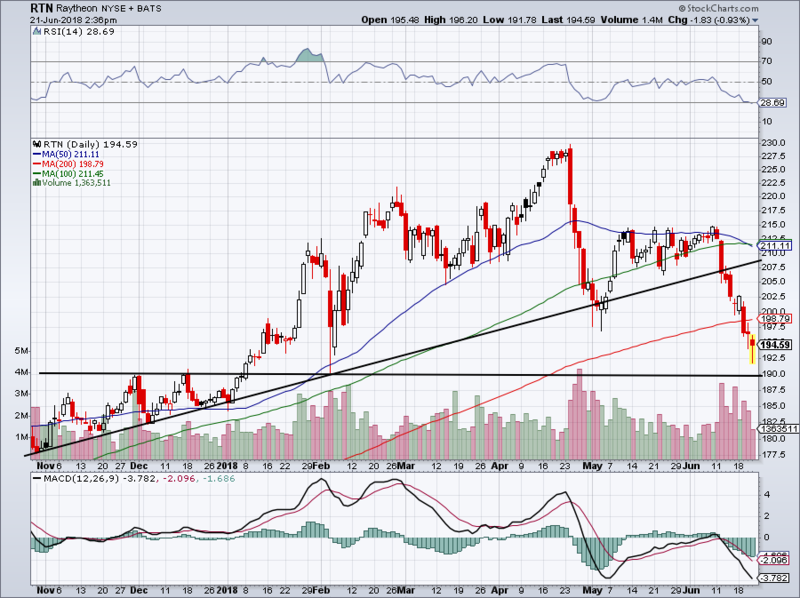 I have liked Raytheon (NYSE:RTN) in the past, but its stock chart is simply not cooperating. However, at least it’s simple to decipher. The clue for bulls to bail was when RTN broke below trend-line support. Now below its 200-day moving average, it’s been a rough ride. Thursday’s rebound off $191 was encouraging though and perhaps that’s as low as it will go. However, bulls craving an attractive risk/reward can consider buying RTN down near $190. If it holds, RTN should rebound amid the secular trend of increasing defense budgets. Should it fail, bulls can bail with minimal losses and bears will be in control. This. Is. Why. Traders. Need. Discipline. 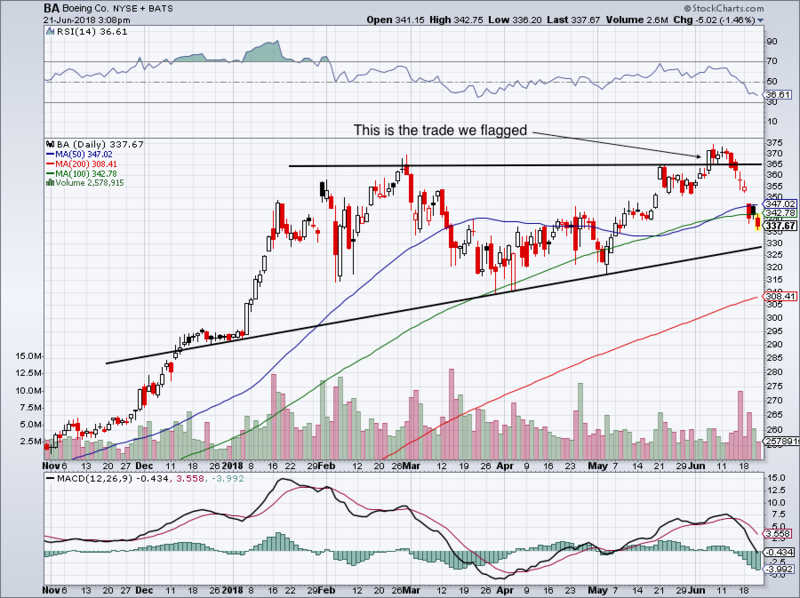 At the beginning of June, we flagged a breakout in Boeing (NYSE:BA). Then the trade-war rhetoric began to heat up and shares were decimated. We also said longer-term buyers may consider buying between $340 and $350, but that changed when the trade-war talk picked back up. On the chart above, we mapped the breakout level we saw on June 6. I also threw on a trend-line of support that could come into play near $330. But certainly, use caution (and discipline!) if you choose this setup. This last chart isn’t a where-to-buy-Boeing play. It’s a chart that shows what happens when you follow your own rules — i.e. stop-out at $365 — vs let emotions and the “hope strategy” take over, praying that BA bounces. In the case of the stop-out vs the hope-and-pray strategy, we’re talking about a $5 loss per share vs a $33 loss per share. The hope-and-pray strategy takes what is supposed to be a small loss and turns it into a huge loser. Article printed from InvestorPlace Media, https://investorplace.com/2018/06/top-stock-trades-for-friday/.